BIG thanks to everyone who came on Saturday to the Friary , it was a great night, very busy, just over 180 folks in the room I think including the band & bar staff. We raised £1,241 ( including the donation of £100 from A & J Stephen Builders) for the Azul Wasi project in Peru ( after outgoings which are just under £1120 to put the event on). This is a FANTASTIC amount to help towards the new shower and toilet block at Azul Wasi. So big thanks to everyone who brought along friends/ family and to those who kindly donated all the raffle prizes too. Also thanks to all those who helped on the night and before the event with posters etc. LAST CHANCE to get cheaper tickets for LIVE CUBAN BAND, Maykel Blanco y su Salsa Mayor in Edinburgh, on Sat 14th October at the Liquid rooms. Email LQsalsadundee@gmail.com for group ticket rate £23 TODAY, they go up to £25 after that, on door price £30. This is a very rare opportunity folks. Please pass the word. LIVE CUBAN BAND, Maykel Blanco y su Salsa Mayor in Edinburgh, on Sat 14th October at the Liquid rooms. Email LQsalsadundee@gmail.com for group ticket rate £23, on door price £30. This is a very rare opportunity folks. Please pass the word. Many thanks to all those who came on Sat eve to the Charity band event at The Friary, we raised £350 for the Azul Wasi project. With special thanks to all those that helped sell tickets, bring people, advertise the event, help on the night, donate raffle prizes and thanks to those who came from further a field. A BIG thanks to everyone who came along last fri eve to The Friary, Son al Son band event. We raised £651 for the Azul Wasi project (after outgoings), a great turn out. Thanks to people who came from afar. Thanks to those who donated for the raffle and to all who helped out on the eve. Big thanks to those who brought groups along and for selling the tickets. Without your help it wouldn’t have been so successful. 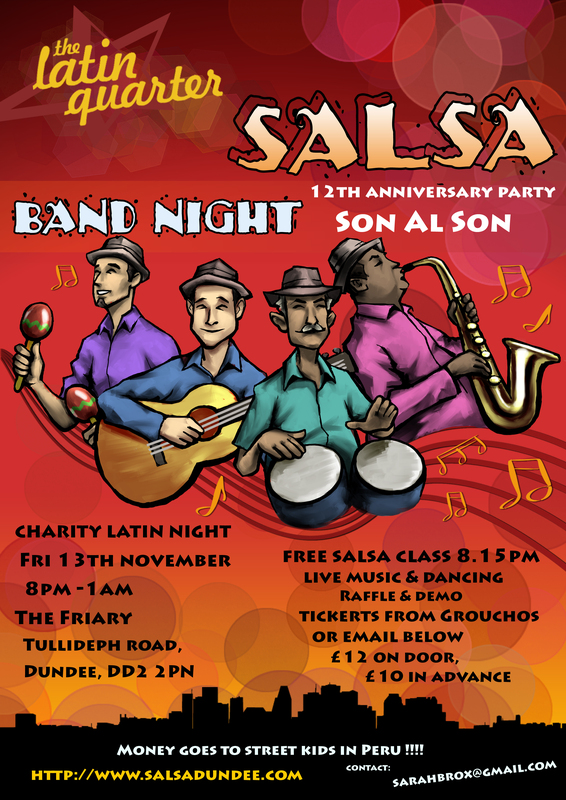 12th Anniversary party : LATIN QUARTER CHARITY BAND NIGHT with the groovy live band SON al SON @ The Friary, Tullideph Rd, Dundee, DD2 2PN on Fri 13th Nov. 8pm-1am. Free Salsa beginners class at 8.15pm. Tickets £12 on door or £2 DISCOUNT in advance from Grouchos, sarah at classes or via sarahbrox@gmail.com. Will be a raffle on the night. Tables can be reserved via same email for 8 minimum for prepaid ticket holders. Details also on www.salsadundee.com. Anyone welcome. Will be bar. All money raised for the Azul Wasi project in Peru near Cusco, home for former street children. The band Son al Son was formed in 2008. Its line-up is made up of musicians from Cuba, Ricardo Fernandes Pompa,(Lead Vocals and Congas) Eric Alfonso (Timbales)from Venezuela,Lino Rocha (lead vocals and hand percussion) from Scotland, Bob Thomson (Bass),Simon Gall (Piano and Vocals) and Euan Allardice (Trumpet). As the name suggests, Son al Son play son, a style of music made popular in 1920’s Havana and more recently in the film “Buena Vista Social Club”. To this day, songs like Chan Chan, El Cuarto De Tula and Dos Gardenias are played in cafes and bars across Cuba. Son al Son have added songs from La Excelencia, Cubanismo and original songs to bring a more ‘salsa dura’ (hard salsa!) feel to there set. Along with the ‘traditional’ songs (with a salsa twist!) and the modern salsa songs,we’re sure Son al Son will get your feet tapping and out of your seat in no time, Gozar! Enjoy! Note: They changed their name to Salsonique for a while but have changed it back to Son al Son recently.